Any quality 3D printed model — whether it’s a prototype, a display model or an industrial part — begins with a quality material. This is especially important for metal 3D printing, as parts intended for industries such as aerospace, defence and automotive must be manufactured to the highest standards. However, the materials used for metal prints are still quite expensive, and so must be deployed intelligently to ensure operations remain cost-effective. A key part of this is maintaining the purity of all powder materials used for 3D printing. Any printing run that fails due to contamination of the materials represents both time and money wasted. However, maintaining the purity of the powders used for metal prints can be deceptively difficult. Indeed, many bureaus are unaware of an issue with their metal powder until it actually leads to a failed print run. One way of potentially reducing material costs is to recycle leftover powder wherever possible. However, while this concept seems obvious, in practice, it is often easier said than done. When sintering metal powders, particles will naturally form small ‘clumps’ in the areas around the part. While these may be impossible to detect with the naked eye, they will subtly change the consistency of the powder’s particle size, which will — in turn — affect the quality of any further parts printed using that batch of powder. One approach to solving this problem is through technology. For example, printers are now available that put all remaining powder through a sieve-style mechanism after printing, to filter out any clumps and maintain its material consistency as much as possible. However, this still means that not all of the powder bed can be reused. Furthermore, even with careful sieving and refreshing of the powder bed, subtle changes in the powder quality will still occur over time, which means it must be carefully monitored in order to avoid failed prints. 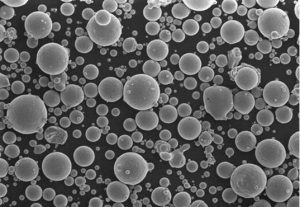 While measures like this mean metal powder can certainly be reused, questions still remain as to whether they will be able to maintain high enough quality standards to meet the strict regulatory requirements in industries like aerospace and automotive. Unless printer companies and material suppliers can provide a cast-iron guarantee that the powder recycling process is completely infallible, it will be of limited use for these industries. In such cases, the only viable option is to accept the ongoing expense of using a virgin powder bed for every print run. In a recent case study by metal powder specialists LPW, an aluminium part (a gas turbine) created with 3D printing was found to contain cracks, even after multiple attempts at reprinting the part with different settings. When LPW were brought in to conduct an intensive investigation into the metal powder being used, it was found to contain particles of Inconel 625. These particles required a microscope to view, yet when they grouped together during the printing process, their incompatibility with the printing material is what led to the cracks forming. It later turned out that the contamination had been caused by an employee’s mishandling of the powder. The 3D printer had previously been used for a different print run that utilised Inconel 625, and the employee had not followed the correct cleaning procedure before adding the aluminium powder bed. The message here is that all metal powders used for industrial 3D printing must be stored carefully at all times to avoid any inadvertent blending, and each printer’s cleaning procedures must be followed to the letter, especially when changing materials. As shown in LPW’s case study, once a powder has been contaminated, it will likely require specialist equipment to identify the cause and deliver a solution, so it is far better to avoid the risk altogether. Powder contamination represents an ongoing challenge for any company delivering metal prints, so it’s something that must be considered carefully as part of your wider project workflows. While technology can certainly support you when it comes to maintaining your metal powder, it must not be treated as a substitute for proper training and awareness of the dangers of powder contamination among your staff. As with so many areas of additive manufacturing, it’s far better (and less costly!) to prevent a problem than solve it, so be conscious of how your powder is being stored and handled, and leave nothing to chance, especially for functional, industrial metal prints. While it will certainly represent an extra stage in your workflows, the extra peace of mind will be more than worth it.